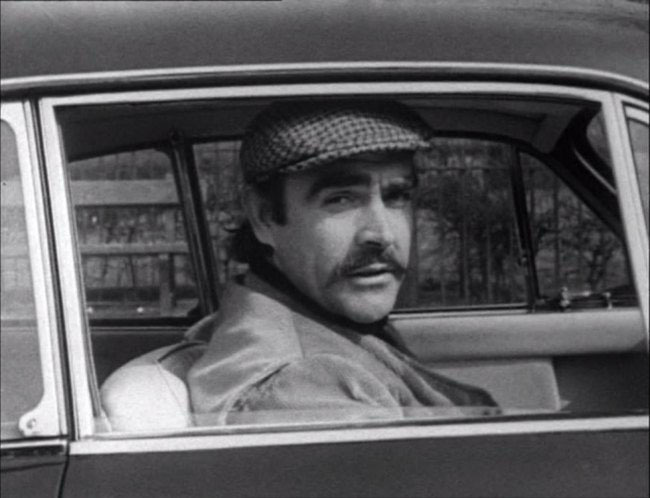 Sean Connery is today, so inextricably linked with the Aston Martin, that the public are surprised to find out he once owned a Jensen. 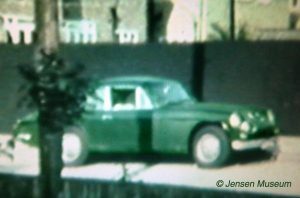 The year was 1967, and the car Connery purchased was a green painted Jensen CV8. 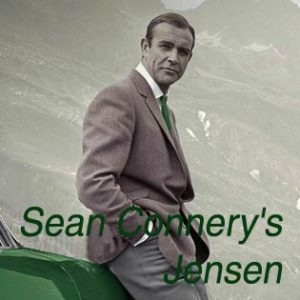 Nearly 50 years later, Sean Connery’s Jensen was acquired by the Jensen Museum. 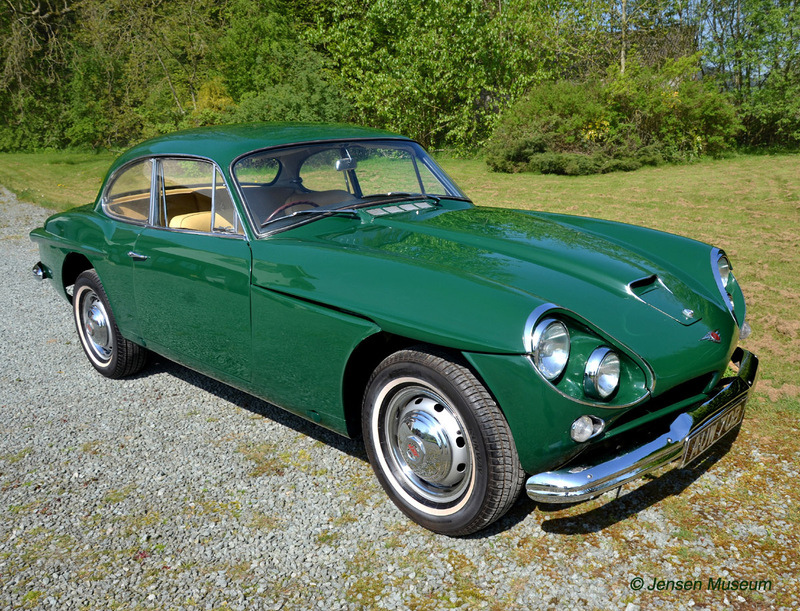 Jensen CV8 chassis number 104/2158 was completed in 1964, and assigned the registration number AUW 70B. The car, finished in a specification of beige trim with green painted body, was delivered to the London-based distributors, Charles Follett on the 1st May 1964. Once at Follett’s showroom, they prepared the car for their customer, Clive Carr, Chairman of the News Of The World. By 1966, Carr had already put his name on the waiting list for a new Jensen FF, politely asking that he was given one of the first cars delivered from Vignale in 1967. Carr found his wish fulfilled. Jensen Motors allocated Jensen FF chassis number 119/004 for this important customer. In fact 119/004 was the first actual Jensen FF sold to a private customer. The first two FFs, had been kept for evaluation, and the third sold to Harry Ferguson Research, for their evaluation of the four-wheel-drive system. Carr’s Jensen CV8 was kept until the beginning of 1967, and then given in part-exchange with Charles Follett against the FF. Suitably cleaned up and made ready for sale, Jensen CV8 104/2158 sat in Follett’s Mayfair showroom waiting for the next owner. The asking price was in the region of £2000. Sean Connery with Aston Martin. The next owner turned 104/2158 into one of the most famous of ‘celebrity’ owned Jensen cars. Sean Connery had just completed filming for You Only Live Twice, and found himself looking in Follett’s Mayfair showroom. 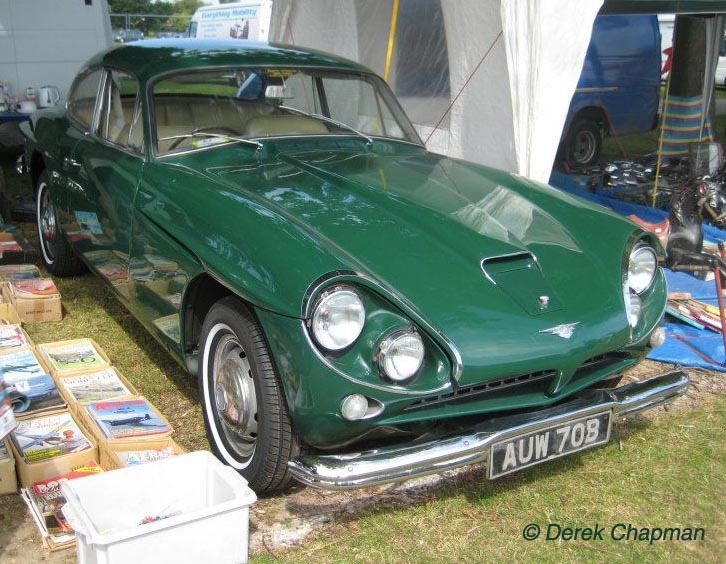 He was taken by a smart looking green painted Jensen CV8, green being Connery’s favourite colour. Connery’s liking for green may have come from his strong support for Celtic Football Club, although much to the disapproval of some, Connery switched support to the Rangers later on. So in May 1967, Connery became the proud owner of a Jensen CV8. After purchase, the car was driven back to Richmond in Surrey, where Connery was living at the time. 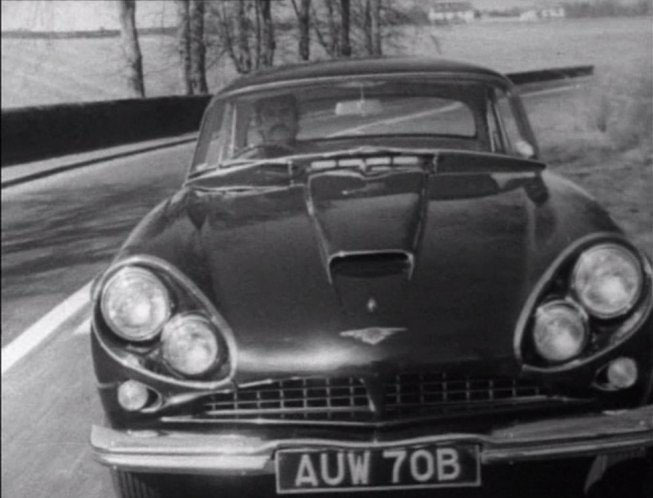 It is interesting to note that Connery could have purchased a 1964 Aston Martin DB5 for the same money the Jensen CV8 cost. 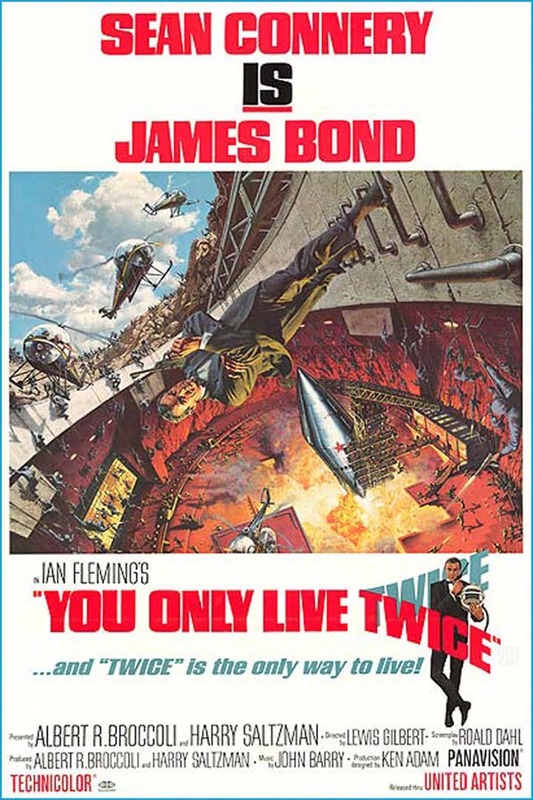 Poster advertising You Only Live Twice. 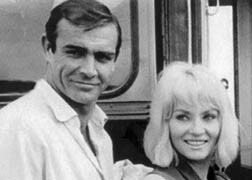 Not long after collecting his Jensen, Connery and his wife, Diane Cilento, would be at the film premier of You Only Live Twice. In fact, Connery’s wife had taken part in the film. She had doubled for her husband’s co-star Mie Hama, in a diving scene. 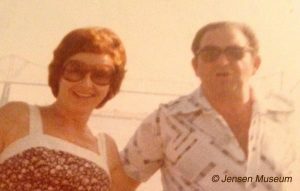 Connery & Cilento in 1967. During Connery’s ownership of the CV8, the car was serviced at the London distributors, Charles Follett. Jensen CV8 Registrar (JOC), John Staddon, met one of the service personnel involved at the time with servicing Connery’s CV8. It was mentioned to Staddon that Connery never came to the garage himself. His Jensen was picked up from his house, and later delivered back. Apparently, on one occasion, Connery’s wife had an accident in the CV8. Connery was furious, telephoning the garage to take the car away, he never wanted to see it again. It would seem Connery later calmed down, and that the CV8 was repaired and returned. It was in the same year as purchasing the CV8 (1967), that Connery directed a short film, The Bowler and the Bunnet. He also played the lead role within the film. Connery driving Jensen CV8 chassis number 104/2158. Connery at the wheel of his CV8. The short movie lasted for 36 minutes, and was made for TV, although was famously never broadcast. The highly political film was about the rescue of the Fairfields shipyard after bankruptcy. In particular it dealt with the new production, management, union procedures, and agreements. This later became known as the (in)famous Upper Clyde Shipbuilders amalgamation. Connery’s Jensen CV8 played a significant part in the film, with Connery himself driving the car. Although never broadcast, The Bowler and the Bunnet is important, as it is the only film directed by Connery. Connery kept 104/2158 for a year, selling the car to Alfred Levitt from Essex in June 1968. Alfred Levitt and his wife, Robbie, photographed in the 1960s. A still image of 104/2158 from a home movie taken by the Levitts in 1968. Levitt was the personal pilot for Kenny Ball & His Jazzmen, and had loosely been involved in the film world due to his piloting skills. It was through this connection that he had known Connery, and purchased his CV8. Levitt was a very skilled pilot. At the end of the Second World War, he was apart of the Berlin Airlift, where pilots were required to fly round the clock 24/7 in all weathers to keep Berlin fed during the Russian Blockade. On one occasion, Levitt was flying Kenny Ball & His Jazzmen to Cork in Ireland, when airport control advised him to divert to Dublin, since the weather conditions at Cork were making it hard to land. The band had a gig that evening in Cork, so Levitt said, I’m coming into Cork. So, with practically zero visibility, and a raging storm, Levitt began his approach. He landed the aircraft safely, and the band made their gig. Levitt was later to relate to his friend, Ron Clover [also a Jensen owner], that he came into Cork at maximum speed. His only real worry was if he could stop the aircraft before running out of runway once on the ground. That evening, the Air Traffic Controller came to visit the concert. Making himself known to the band, he was allowed to go on stage and relate the story to the audience. After all, without Levitt’s tenacity, the concert would have been cancelled. Levitt only kept 104/2158 for a few months before selling it to his friend who ran the Grange Grove Fruit Drinks Company Ltd.
By 1970, 104/2158 had changed hands again, this time to Robert Rumball from Shefford in Bedfordshire. Rumball remembered his famous CV8 when asked about it in 2010. “The car was a Green CV8 Mk 2 registration number AUW 70B. I purchased the car from Hills of Woodford in early April 1970, it then had 46,000 miles on the clock and interestingly, had previously been owned by Sean Connery. His name and signature were on the old style log book. 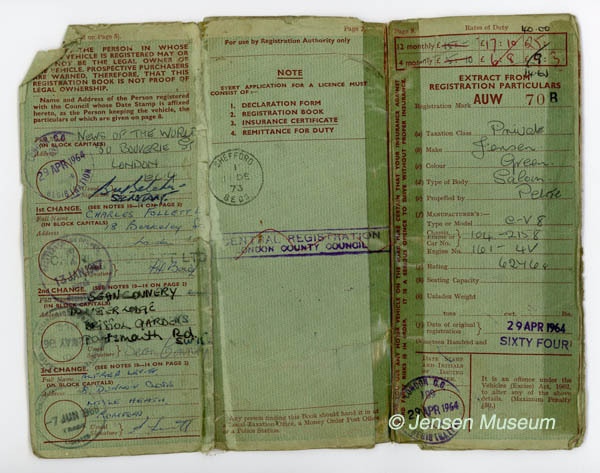 The green log book belonging to 104/2158. 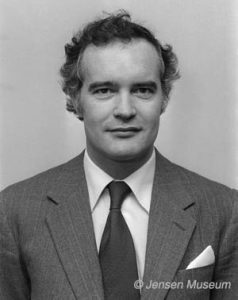 Connery is shown as the second registered owner. 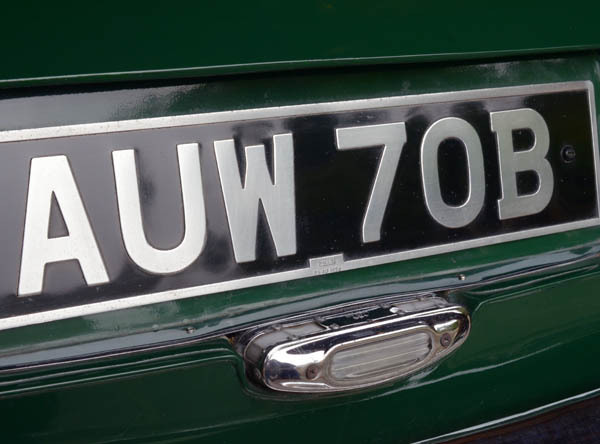 Original AUW 70B registration plates as fitted by Hills in April 1970 (photographed in 2017). 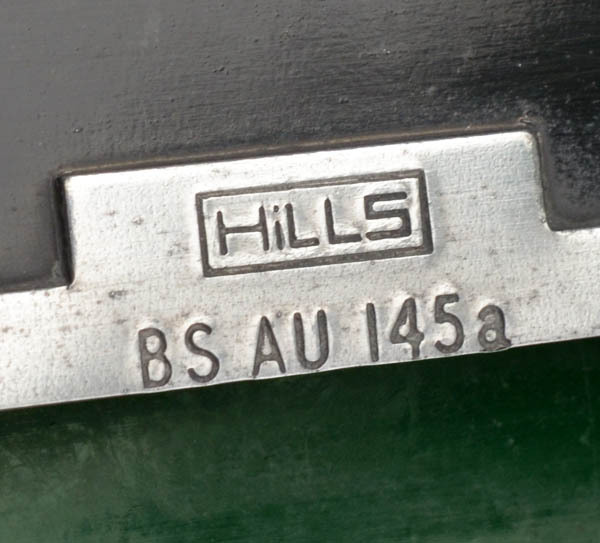 Detail photograph showing the Hills name plaque to the registration plates. I owned the car for 17 years and only sold it because I was moving from England to Australia (big mistake I should have brought it out here and restored it). During the 17 years of ownership I covered around 120,000 miles in the car and enjoyed owning and driving it enormously. I purchased the car for about 900 pounds and sold it to a private purchaser in 1987 for 2,500 pounds. The purchaser was Jack J Jones and lived in Hoddesdon Hertfordshire. Jones put the CV8 into storage, and kept the car until the early 1990s. By the early 1990s, 104/2158 had been sold to Kauer Mann of the Victoria Bodyworks in Essex. 104/2158 exhibited at the 2011 Enfield Motoring Pageant. 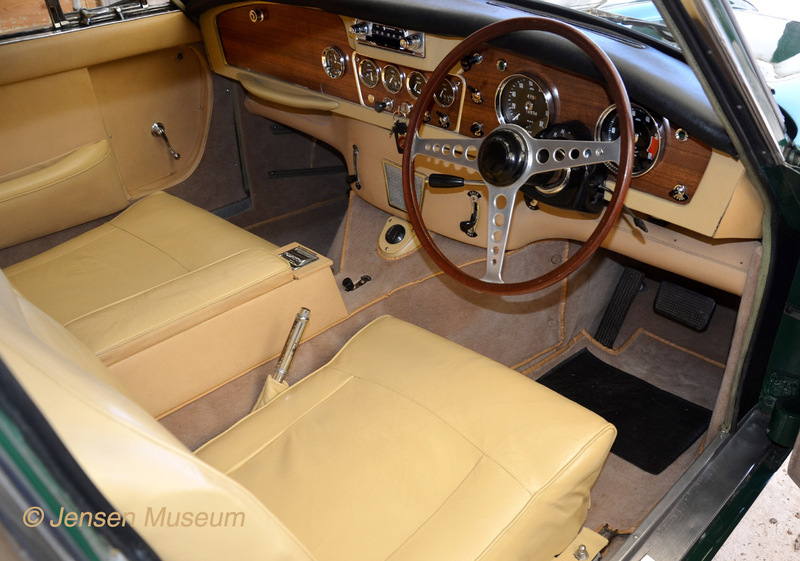 Mann kept the car through to 2014, at which time the car was acquired by the Jensen Museum. NOTES: See also our feature, Vignale Jensen FF 119/004 | First FF Sold To A Customer. 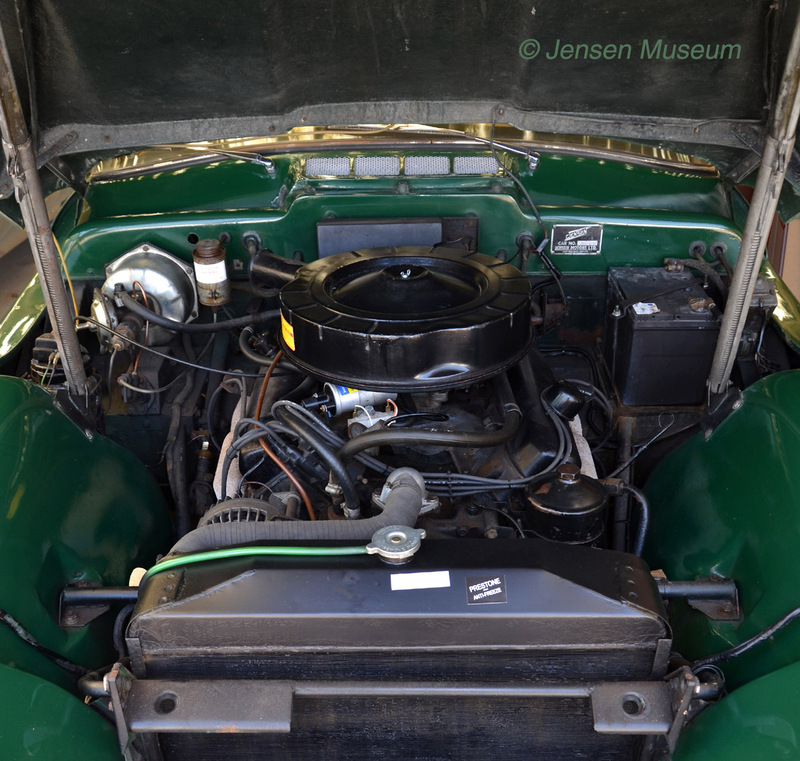 This feature details the Jensen FF chassis number 119/004 which Clive Carr part-exchanged the CV8 for. The focus of the Museum is always towards conservation rather than restoration. Chassis / Body: The car chassis is of sound structure. An area of rust found to the front driver-side & passenger side footwells has been replaced. The green paint to the fibreglass body survives in overall excellent condition. The existing cellulose paint has age, and maybe a respray by Charles Follett from 1967, after Sean Connery’s wife had an accident in the car. The Museum believes the paintwork should be conserved. The original aluminium pressed registration plates, from when Hills of Woodford sold the car in April 1970, remain on the car. Both plates bear the Hills name to the lower centre. It is important as a part of the car’s history that these plates are conserved, and remain with the car. Mechanics: There has already been ongoing work to remove modifications and revert mechanics as close as possible to 1964 specification. Engine-bay of 104/2158, photographed in 2018. Interior: At the point of acquisition, the interior of 104/2158 looked poor. 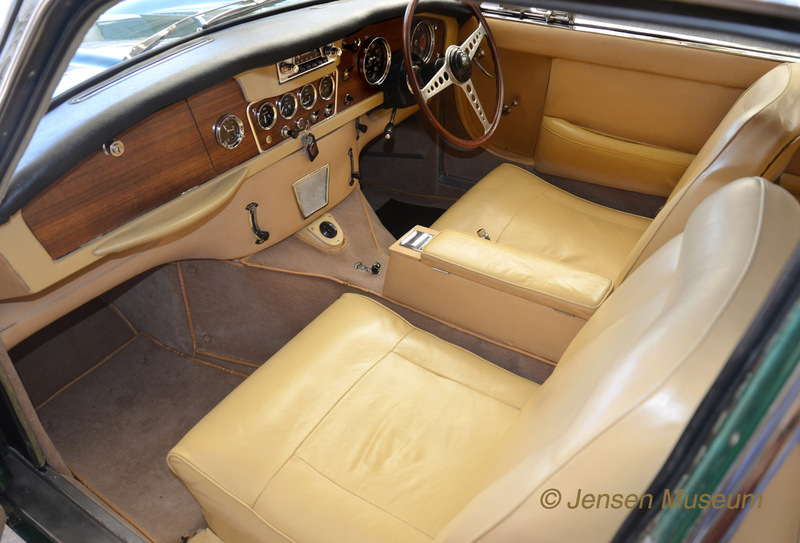 The original beige leather trim was present in the car, but had faded badly. All vinyl components were present and in good order. The carpets were in particularly poor condition, and were in any case replacements from an earlier period (1970s/ 1980s). One section of original carpet was found still attached to the underside of the passenger side dash area. Removal of the car’s interior has revealed the original chalked chassis number to the rear panelwork. This has been preserved. All leather and vinyl work has been thoroughly cleaned. A colour swatch of the original unfaded leather was sent away for replication. All leatherwork has been treated, and sprayed back to its original unfaded colour. Using the section of original carpet with edge binding, the Museum has sourced the exact colour and grade of carpet, and managed to replicate the type of vinyl edge binding. The interior has now been refitted. Driver-side view of the interior. Photographed in 2018. Passenger-side view of the interior. Photographed in 2018.